Coat a glass pie plate with cooking spray. 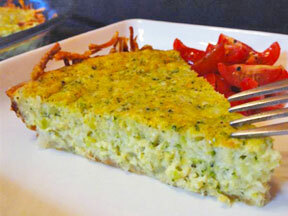 Spoon the shredded hash browns into the pie plate and press down to cover the entire inside and rim. Bake in the oven for 20 minutes, or until the edges are nicely browned. Set aside. Cook broccoli & cheese sauce according to the package directions and let cool. Once cool, put in the food processor and pulse a few times until smooth, not chunky. In a large bowl, beat 3 large eggs. Add ½ cup of light cream, the blended broccoli & cheese sauce, 1 cup of cheddar cheese, 1 teaspoon of grated cheese, ½ teaspoon of salt, pepper and 1 teaspoon of parsley. Pour the mixture over the hash browns. Bake in the oven for 30 minutes, or until center has set. Serve with a cherry tomato salad to complete your meal.